The original pattern for this dress is, as its name says, actually a pinafore, which means it is made to be open at the back. The pattern is a free one by Maxine Gonser. I made some small adjustments to make an actual dress. Below I’ll provide a copy of the actual pattern in black text. My adjustments are added in blue text. On Ravelry they suggest Bernat Baby Sport Solid, an acrylic yarn with a recommended hook of 4mm. The stated amount of yarn needed it approx. 3oz or 85g. I used Bergère de France Sport, an acrylic-wool blend with a recommended hook of 3.5 and 4mm. I used a total of 3 skeins, but I made the pattern slightly larger than the original pattern. My dress fits my niece of 8 months very widely. So she’ll be able to wear it a couple of months more! I didn’t make a gaugeswatch. 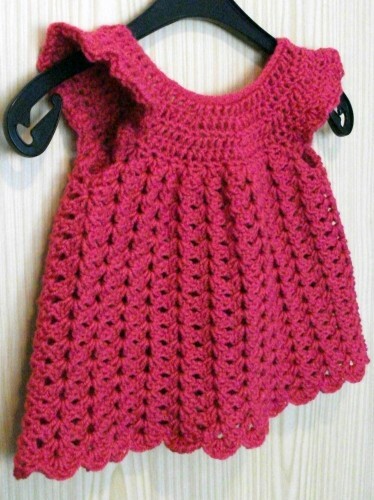 Because I intended the dress for my niece, older than 3 months, I opted to use a bigger hook. I used an 8mm to cast on and a 7mm for the rest. After my extra row (4b) I started crocheting in the round, instead of in rows. The original instructions are copied below in regular text. My adjustments are in blue text. Row 5 = Round 1: sls in top of beginning ch3 of row 4b, to connect both pieces. Make sure the work isn’t turned on itself. ch3, dc in same st as sls. * skip next st; shell in next st. Repeat from * until end. Skip next stitch, 2dc in last st. sls in top of beginning chain. Row 6: ch 3 . turn. dc in the same st. shell in next 6 shells. ch 3. skip next 10 shells. shell in next 11 shells. ch 3. skip next 10 shells. shell in next 6 shells 2dc on top of ch 3. Row 6 = Round 2: ch3, dc in same st as sls. Shell in next 6 shells; ch3. Skip next 10 shells. Shell in next 11 shells; ch3. Skip next 10 shells. Shell in next 6 shells. Skip dc. 2dc in last dc. Sls in top of beginning chain. Row 7 = Round 3: ch 3, dc in same st as sls. Shell in next 6 shells. dc in each of next 3 ch. Shell in next 11 shells. dc in each of 3 ch. shell in next 6 shells. 2dc in last dc. sls in top of beginning chain. Row 8 = Round 4: ch 3, dc in same st as sls. Shell in next 6 shells. skip first dc of underarm and shell in next dc. Shell in next 11 shells. skip dc of underarm and shell in next dc. Shell in next 6 shells. 2dc in last dc. sls in top of beginning chain. Row 9: ch 3. turn. dc in same st. shell in each shell to end. 2dc on top of ch 3. Row 9 = Round 5: ch3, dc in same st as sls. Shell in each shell to end. 2dc in last dc. sls in top of beginning chain. Row 18 = Round 21: ch3, dc in same st as sls. sc in space before shell. * 5dc in shell. sc in space between shells. repeat from * to the end. sc in space after last shell. 2dc in last dc. sls in top of beginning chain. sew 3 buttons on the rt side of the yoke. use space at end of rows for buttonholes. you can also sc up the back side . 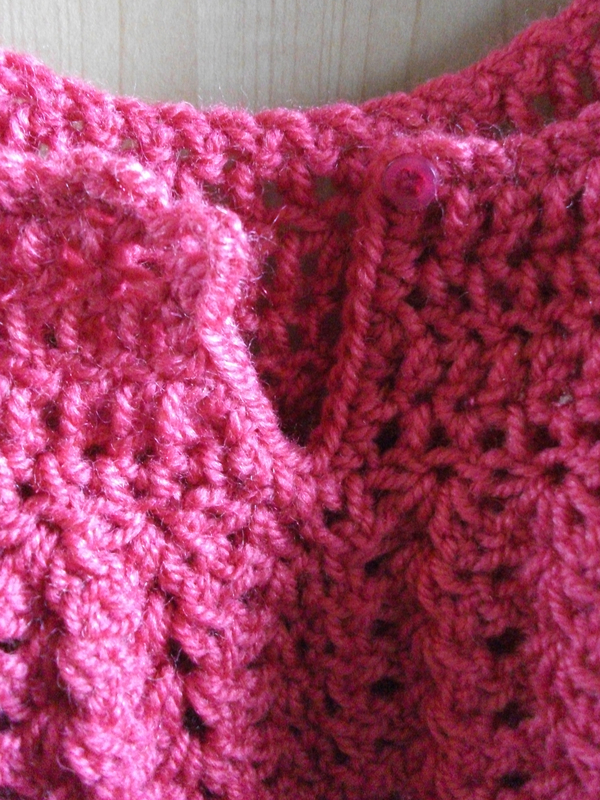 working 3 ch2 loops for buttonholes on the left side. sc across the neckline and sc down the other side. If you crocheted a closed skirt (blue instructions), than you now only have a small opening at the top of the neck. Around this opening I crocheted sc and created a loop of 2 chains on the left side. 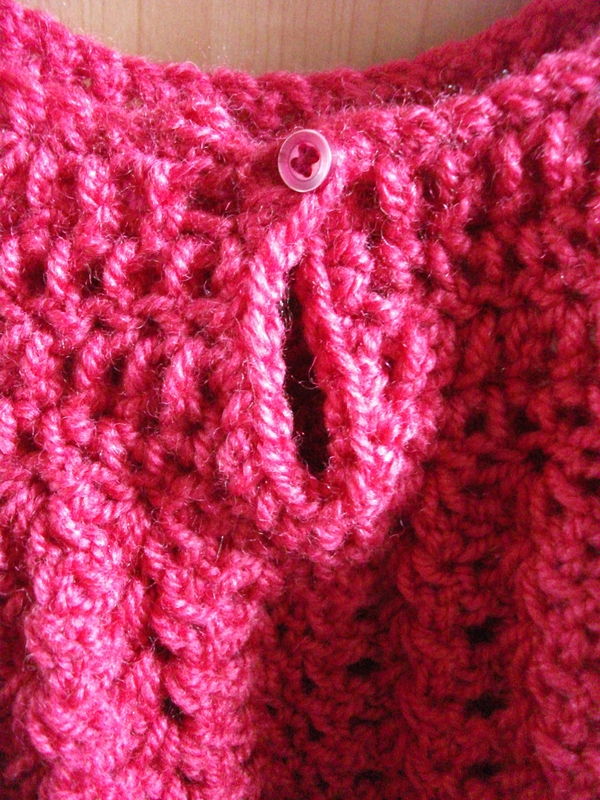 On the right side I sewed on a tiny button. And that’s it. With these instructions you should be able to make exactly the same dress as me! Wonderfully done! I’ve created this before using the original pattern, but I think that I will have to do it again using your adjustments! Thank you so much for sharing!